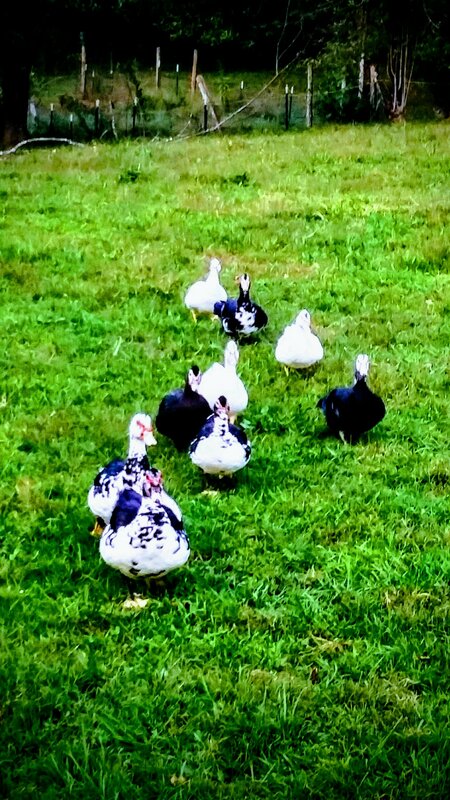 Unfortunately, I didn’t get this week’s Friday’s Flock posting done because I rehomed a whopping thirty one ducks to a farm in Dixon, Tennessee. It was sweet seeing them meet the other geese and ducks, and a relief that the feed bill is essentially cut in two. My remaining six duck hens are with the chickens, and the drake is now bunking with the geese. Hopefully this way I’ll get to enjoy the eggs, and not have them breeding like, well, ducks all over the farm. But, I did make progress on the knitting and spinning projects. I’m still spinning Romney in the grease. In fact, I found another fleece in my studio in what I thought was an empty bin. 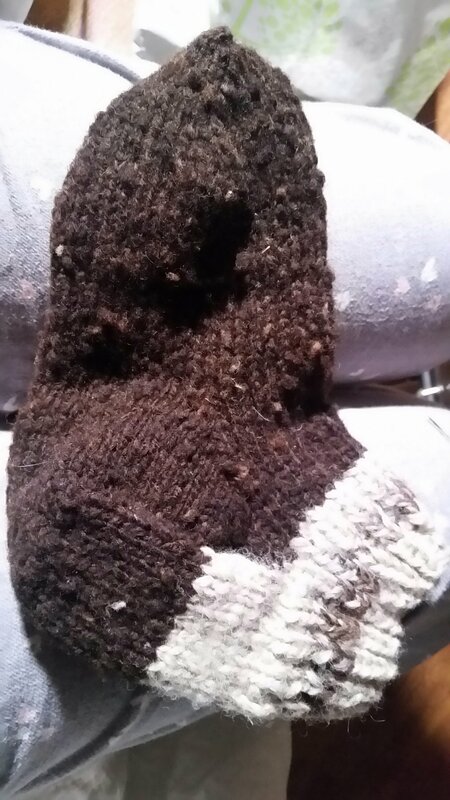 However, the carding on the alpaca and wool mittens is coming along well. Originally, the plan was for seventy percent wool and thirty percent alpaca. Then I realized i want them even warmer. So, it’s a fifty fifty blend. I ran out of jacob wool, so instead I’m finishing up with black targee. It’s not as soft, and boy is it high in vm. But the color matches, and it should felt nicely. It goes on the wheel this evening! My mom loves handspun socks for slippers around the house. I wanted to have them done last week, but it didn’t happen. Between hay runs, freezing weather, a ewe coming up pregnant, Christmas dinner, moving into the main house for the remainder of the winter, and ducks, they just didn’t get done. Oh, and they needed resizing in the toe. Like, serious resizing. We got a good laugh. So, this one is almost done, and then it’s mitten time! Technically, this was done last Monday. However, it was a gift and a surprise. It was supposed to be a sheep, but I think it’s more bear than sheep. I’ve never made a stuffed animal before. Not bad for a first go. It was fun to make, and maybe there will be more in the future. Maybe. But he is super cute. 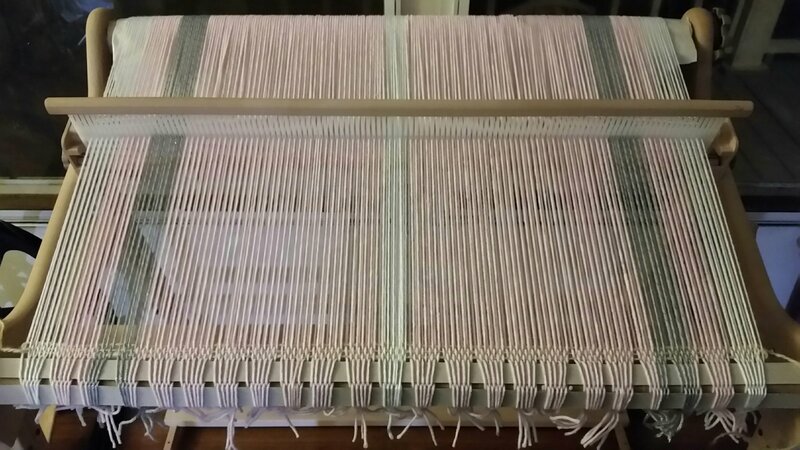 I did get the loom warped! This time I’m making a wrap. It’s acrylic, but this piece needs to be washable. It’s just a simple tabby weave, and it’s coming along quickly. Well, I’m off on another hay run and to muck the stalls. PS. If you enjoyed this post don’t forget to like it and follow. It really helps us out. This past week I made the Sacre Couer shawl by Nim Teasdale. It’s a free pattern on Ravelry. I actually started this shawl in August, but lacking yarn, I had to make it a spinning project before it could continue as a knitting project. Week before last I finally got around to spinning up enough yarn to finish my little shawllette. 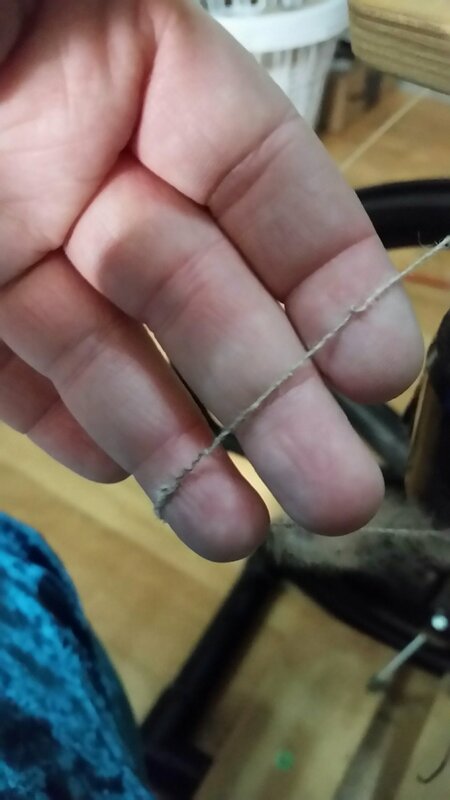 When I sat down to finish I discovered a dropped stitch that wasn’t easily corrected. I also decided to change the colorway. So, I embraced my inner Kermit and frogged the whole thing, and bought some beads. This is my first beaded project. The pattern is very flexible. It’s designed to make anything from a small shawllette or scarf to a full cuddle up with a throw sized shawl. Since this piece was always destined for the Etsy shop, I decided on a shawllette / scarf size. There are two options for the cast on. The first is a garter tab, which is not my style. The second is to cast on nine stitches. So, me and the Old Norwegian cast on got busy. The beginning section sets up the correct number of stitches to begin knitting the Arch Lace section. This is one area where the shawl is flexible. I like the fact there is a chart of how many set up stitches you need before knitting the first lace chart. It took the math out, and that’s always nice. The Arch Lace section was easy to knit through while watching a documentary on the christening of Edward, the Boy King. I did two complete repeats, and then the first eight rows again before moving onto the Stain Glass lace chart. And that’s where this shawl took a left turn. Well, specifically it took a left turn at a downhill gallop heading into a fence with a busted bridle at row nine. No matter how many times I knitted and frogged, I just couldn’t get it to work. It became a jumbled mess. I even frogged out the Stain Glass section twice and started again. Finally I decided to stop before building a bonfire, dancing about like a mad woman, and using the pattern instructions to light shawl and knitting needles ablaze. I finished out the piece to row nine, and used a 3/5 picot bind off. Then I blocked the entire piece, and breathed a happy sigh of relief. I really do like the way this came out. I do plan to use the pattern again, up to row nine, that is. I’m wondering if there is a misprint in the pattern. Overall, it’s well written. I printed the pattern off ages ago, so it’s very possible it’s been corrected. Or, it could just be a case of my dyslexia kicking in, which is very possible. It was also good to try beading. Beading definitely slows knitting down. It basically doubles the time. So, unless it’s a wedding piece, beads just aren’t happening in my studio. If you do bead work, bless you. You’re a more patient soul than mine. My big take away is the next time I decide to do a lace pattern I’ll use an acrylic test yarn before breaking open my handspun. Test knits aren’t just for designing. Fortunately everything turned out well and this lesson wasn’t too costly. Ps. Don’t forget to like our posts and subscribe! It really does help us out. We had four inches of rain over this past week, and almost three were over a twenty four hour period. The entire homestead quickly went from damp to soggy to a trees floating through the front yard and wading through squelching mud. I’ve gotten lots of spinning and knitting done this week! Our driveway and front field. The water is about waist deep. 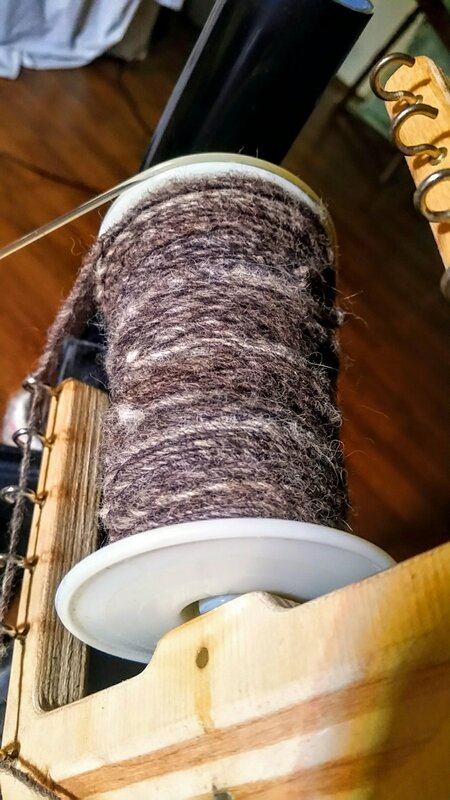 This past week I’ve been spinning up a beautiful Romney fleece in the grease as featured in this week’s Winding up Wednesday: Spin that Fleece. My current sweaters are rather breezy commercially produced cotton. So, with over fifty pounds of white Romney wool in my studio and another twenty in the barn I decided knitting a sweater for myself is in order. It’s spinning up into a soft aran weight three ply. Once I have enough yarn for a decently long sweater with a shawl collar I’ll put this fleece on my combs and make yarn for the Etsy shop. I plan to spin Romney for the next several weeks, so there won’t be too much to report for the next thirty pounds of spinning. In addition to the three ply I’ve spun up some hanks of two ply sport as a gift. One of the mini hanks is dyed using marigolds. Two ply made from mother and daughter. They didn’t full at the same rate…. but still it’s the thought, right? 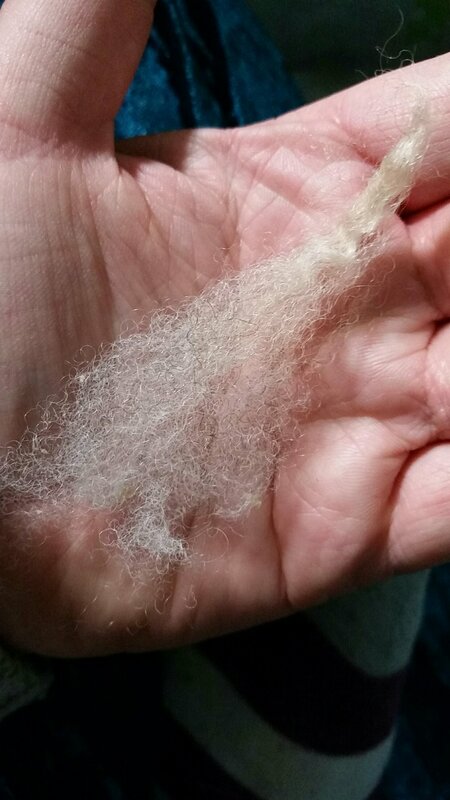 I’ve also been spinning up random bits of fleeces that I’m finding here and there. Any fluff bits less than half a pound are getting stuffed into a bag. I plan to just put it all randomly through the drum carder when I get a few pounds. It’s destined to be brilliant or shear madness. I do plan on squeezing in some Targee alpaca blend this week. I desperately need new mittens for morning chores. I’m hoping with the Targee it felts easily and with the alpaca it keeps me warm. My Sacre Couer shawl is finally knitted up and finished! I had to frog out the original work due to a dropped stitch. I tried to fix it, but if you’ve ever tried to fix a dropped stitch in a complicated lace knitting pattern, then you understand why sometimes you need to just love Kermit. I was going to just rip back to the mistake, but then I began looking at my color palette and decided to just start over knitting from the beginning, with bead work. I’m glad I did. I’ll be reviewing this pattern next week. It’s a beautiful shawlette, but it definitely had difficulties. I also finished another project this week, but I have to wait until next week to show it since it’s a gift. But it sure is cute! I have one sock left to finish up this weekend for tomorrow. It’s just a pair of plain basic socks knitted up on dpn’s. The wool is squishy Jacob. I don’t remember who it is, but I’m think it may be Charlemagne Bolivar’s. I do know these socks are not fancy, but they are super comfy and warm. I may make a new pair for myself, too. I’ve continued dying locks this week. Well, I continued until the rain turned or spring muddy and we stopped using piped water until it clears up again. As soon as I have decent light again the locks will go in the Etsy shop, too. And when the water clears up I’ll be finally rinsing that last batch of lavender dyed locks that sitting under the kitchen bench. This week has been a productive one, even with the weather. Yes, chores in the cold rain aren’t fun, but it has set me thinking on how people traditionally dressed in wool on farms, and what items I can incorporate into a modern style. I have man-made winter and rain clothing, but it never keeps me as warm and dry as my wool. Even the manufactured items I favor tend to be all wool or all cotton. As much as dealing with this deluge is unpleasant, the water will keep the pasture in shape, providing green grass this spring. I’m thankful for the squelching mud and extra mucking, because it’s the cycle of nature that allows my flock to thrive and keep me warm and dry. We are blessed with an abundance of wildlife here at Serenity. We regularly see deer in the woods, squirrels, the occasional coyote and timber wolf, turkeys, herons, song birds, hawks, and even bald eagles. We have a possum living under our house named Otis. However, living on the creek we get to enjoy the engineering marvels of the American Beaver. This year they’re living almost in the front yard. So, in addition to the regular work, knitting, spinning, sewing, and celebrating holidays, we’re wrapping trees in chicken wire. Even as pest like as these overgrown rats are, it’s difficult not to admire their industry and ingenuity. One of our trees wrapped in chicken wire. We’re trying to preserve our big tree, some of which have tops as big as the house! I enjoy spinning roving, real traditional hand combed roving, not processed top being sold as roving. However, spending hours with my Viking combs can get exhausting. My arms get quite the workout daily mucking stalls and hauling hay, so by the end of an hour combing my shoulders are aching loudly. What’s my solution when I’m craving a true worsted yarn and farm chores are heavy? Lock spinning straight from the fleece. That’s correct. 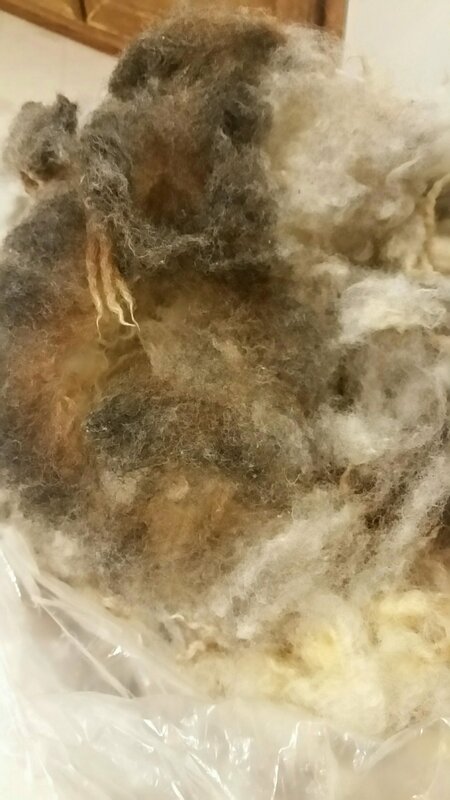 Part of Daisy’s fleece is slated for spinning with no processing beyond a good wash out in hot water and some flick carding on the ends. This method is not suitable for short fleeces by a long shot. I’ve actually flick carded the tips on fleeces with a one inch staple. It was tedious to say the least. But Daisy has gorgeous five to six inch locks, and a perfect Romney lock structure. This spinning is gift spinning, and I’m planning on featuring the technique and dyeing the first Winding up Wednesday in January. In the mean time, some of Daisy’s mom’s locks are headed to the Etsy store. Somehow I managed to finish up both Oatmeal Girl and Jackie this week. It was definitely a challenge. Overall, I’m pleased with both spins. Unfortunately, I didn’t get Jackie’s fleece spun in time to continue knitting the Sacre Couer shawl. I’ll finish washing out the yarn this week, and hopefully my newest blanket will go on the loom the first week in January. Jackie in front and Oatmeal Girl in the back. Jackie is the lightest grey I’ve ever seen. The Sacre Couer shawl is still on my needles this week. Unfortunately, I just didn’t have time to work on it last week. But, finishing it up is my main goal this week. I have decided to put beads on it. I’m considering some shiny silver beads, or maybe black. It really depends on what Walmart has in stock. One of the trade offs for living in a small town is that Walmart is the only craft store. But, hey, we’re getting a Burger King and a fourth traffic light! Oh, and there’s still a hitching post at Walmart. So, at least our Walmart is cool that way. Sacre Couer Shawl – Finally all the yarn made! Speaking of Daisy early, I dyed some of her Mother’s locks this week. They’ll go in the Etsy shop this evening. I used food dye for this project. I’m beyond pleased with the results. I dyed these in the microwave. I’m slightly suspicious of microwaved food, and microwaved locks sounded a bit far fetched. However, microwaving locks is my new addiction! They turn out so well. Hopefully, the beavers won’t keep me too busy this week, and I’ll be as busy as they are this coming week in my studio. With the New Year approaching my mind is thinking ahead to planning new projects. Many are as ambitious as my creek dwelling neighbors. However, I suspect I’ll never be as single minded as our busy beavers. The hut is actually under that tree in the creek bank, but they have an impressive pile of food. As mentioned in this week’s Sunday’s Sassy Stitch and Spin I made the Shawl Collar Vest by Jennifer Miller. It’s a free pattern on Ravelry, and it’s a great pattern, too. I enjoyed making the vest and it’s quickly become my new favorite around the house item. I rarely make heavier weight yarns. I enjoy working with sport and dk weight yarns the best, and frankly I enjoy size five to seven needles the best. They’re the perfect size in my hands. 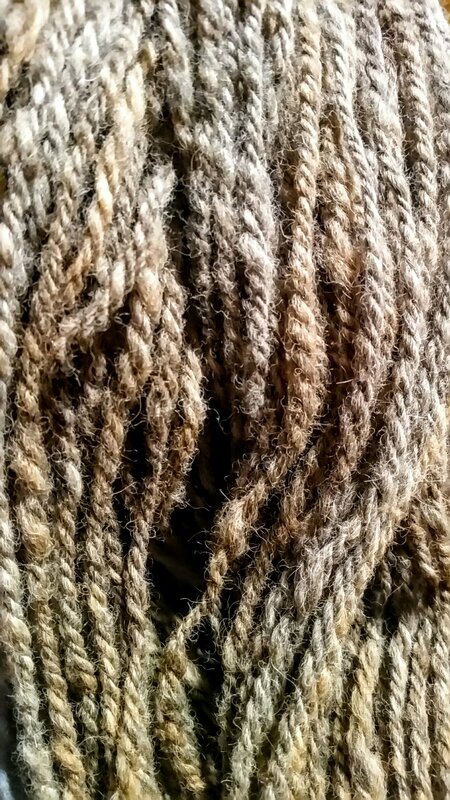 But occasionally I’ll do a bulky or heavy aran weight yarn. That’s exactly what I made one afternoon. I had texel wool laying around in my studio. It’s a short staple, maybe two inches, and it was heavy on the vm. I ran it through the picker, and then carded it up on my hand carders. I spun it slubby and squishy and then did a traditional three ply. I also dyed it, and didn’t like the color. So, back into the dye pot with rit navy blue and a few tightly tied places to preserve the pink it went. It’s not exactly like I wanted, but it’s a wearable color on me now. This was another fleece most people would trash, and now I have a comfortable bed jacket! A little work goes a long way with a lower grade fleece. The pattern is actually the exciting part of this project for me. I’ve never knitted a sweater or garment other than shawls, hats, scarves, socks, and gloves. There’s something about fit, sleeves, collars, etc that intimidates me. Nevermind I can knit up Estonian lace like nobody’s business, a collar makes me think twice. When I saw this pattern I thought, “this is exactly what I need”. The pattern is incredibly simple. 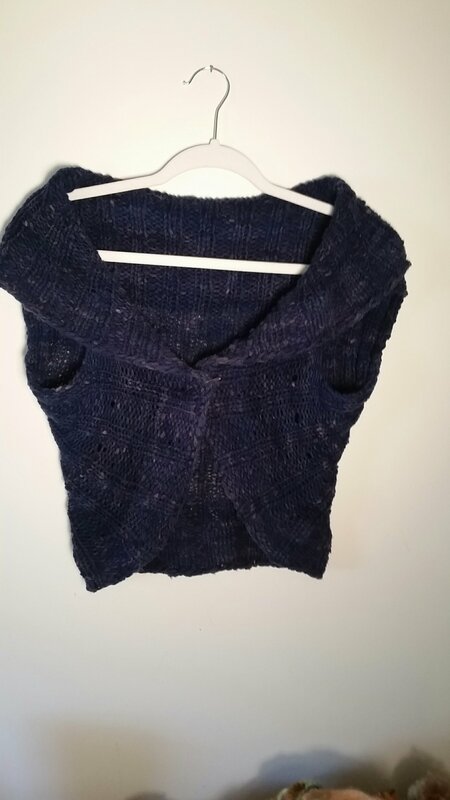 It’s all worked in ribbing, and the sizing is extremely flexible. It starts out flat to create the yolk and arm holes and then joins up into knitting ribbing in the round. All together it took maybe four hours. I did run into one snag that’s completely on me. I did my typical backwards loop cast on. 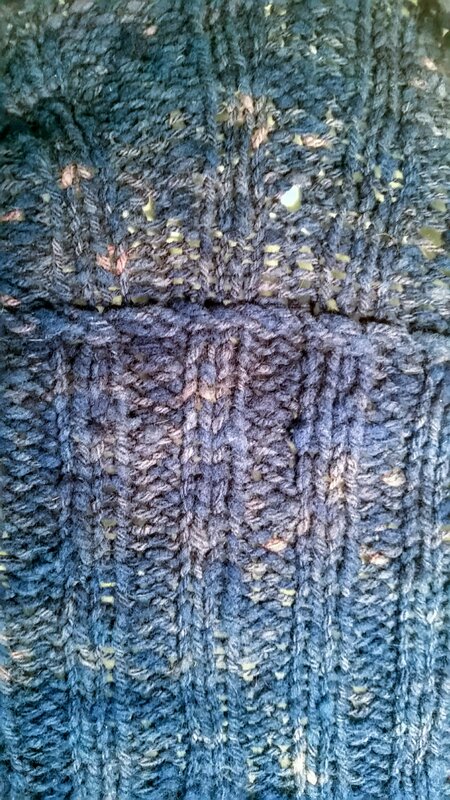 When it came to picking up stitches and keeping the ribbing lined up I ended up with a line on the inside. I think if I had gone with a long tail cast on it would have worked out better. Oh well, next time. There will definitely be a next time. I’ll also make my vest longer next time. I didn’t have enough yarn to get a long line like I typically wear. But those are my issues, and part of the learning curve. As knitters we sometimes get into ruts. Oh, look, another shawl, just like the five others not being worn. Sometimes we just need to do something different, get out of the comfort zone, and be daring. Okay, we just need a new pattern that’s not too difficult. For me, this was that pattern. This experience has also given me a jumping off point to explore other sweater and vest patterns. I’m seriously considering a traditional pull over sweater as a February 2018 project. Chunky yarn can be fun. There was something intensely gratifying about seeing so much progress in so little time. I was watching McLeod’s Daughters while knitting this, so I was knitting casually. I’ll definitely be looking to balance out my projects portfolio with these sorts of patterns in 2018. P.S. I’m in no way associated with Jennifer Miller. I just REALLY enjoyed knitting this pattern! Winter has finally arrived to our little cove and driven me inside for the yearly hibernation. We aren’t expecting a day over forty degrees until March or night above freezing until April. I don’t know how our northernmost neighbors cope, but around her we snuggle in and wait. Oh, I’ll still be out to see my sheep, love on hens, and train my riding steer, do chores and what not, but the days spinning on the porch or knitting under the pear tree over over until late spring. I’m so looking forward to getting some serious knitting accomplished and starting the winter spinning campaign before next year’s shearing in May. So without further Adu here’s this week’s Saturday’s Sassy Stitch and Spin! This week’s spinning Project is to finish up the Jacob ewe fleece from last week. There’s less than a pound to go. This particular ewe belongs to my neighbor at Spring Rock. She had a skin issue, and I snagged a free fleece on shearing day. I did have to heavily skirt this fleece, but I am pleased with the over all results. The fleece was divided into two portions: dark and light. The sheep is freckled, which means there are black specks throughout the cream wool. This creates a lovely heathered oatmeal yarn. I was thinking about using all of this fleece as warp, but I think part of the yarn will end up in my new socks! I decided to card this particular fleece on my curves hand carders. The fleece is short, and even after sending it through my Little Dynamo picker it was a bit “farmish”. I found carding sorted out the majority of residual rubbish. 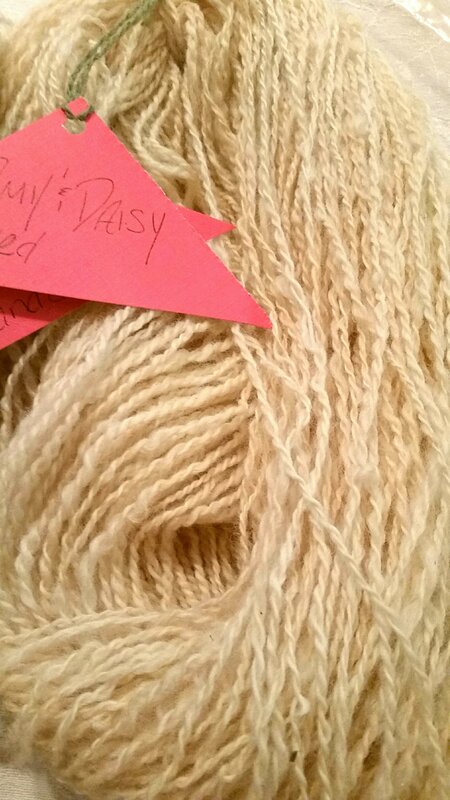 The singles are a traditional long draw, and the final yarn is a fingerling Navajo three ply. The black wool from this sheep is brown headed into lilac. It’s not a true lilac, yet. I think the color is lovely, and I’ll continue with the same spinning style and weight for the entire fleece. My next spinning Project for this week is to finish up this gorgeous lilac Jacob fleece from Jackie. 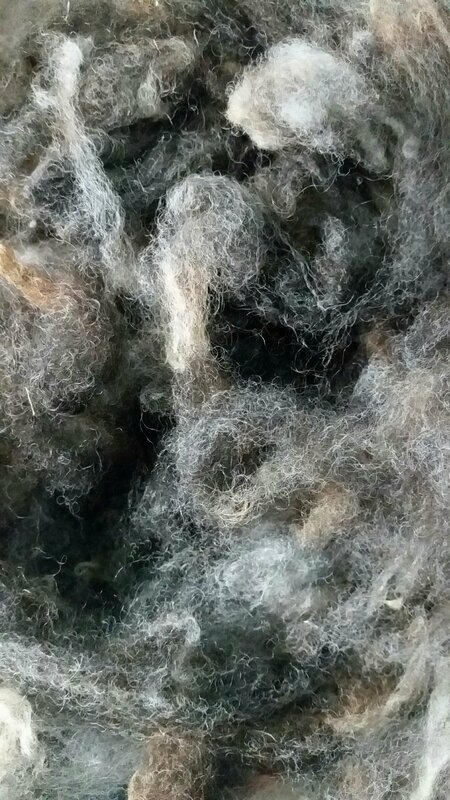 Jackie, a ewe, died several years ago and I’ve been putting off spinning her fleece. The white section of wool is already sitting by the loom waiting for me to finish up the warp. But the lilac, well, that’s going into something special: my current shawl project. It’s surprisingly soft, but then again she was still fairly young. I’ll be using her wool in my current knitting project. It’s been a while since I took on a lace shawl. I found the Sacre Coeur shawl pattern on Ralvery and knew it was perfect for my next shawl project. There are three patterns in the shawl so I decided to use three different yarns, all handspun, of course. The first is some Shetland I traded Romney for. It’s a beautiful moorit. It’s spun dk weight on a drop spindle. The Arch Lace section is some of Charlemagne Bolivar’s second fleece. 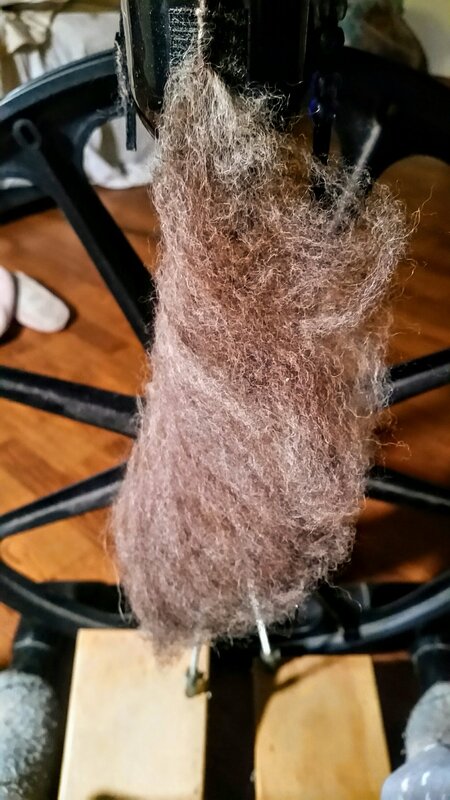 It was spun on my antique wheel, Abigail, from homemade combed roving produced on my Indigo Hound hand combs. I used copper, spinach, carrot tops, some holly hocks, and coffee in an iron pot and lots of patience to concoct this color of green. I don’t think it’s a repeatable colorway. The next section of lace will be Jackie’s lilac wool that I’m currently spinning. I am keeping a bit of it for my next color work project, but her lilac is a perfect color. I’m still debating to put on beads or not. But that’s a decision for another day. This week I started and finished my new sweater vest! I was in the mood to make something chunky and quick. I chose to use some texel i had just laying around. 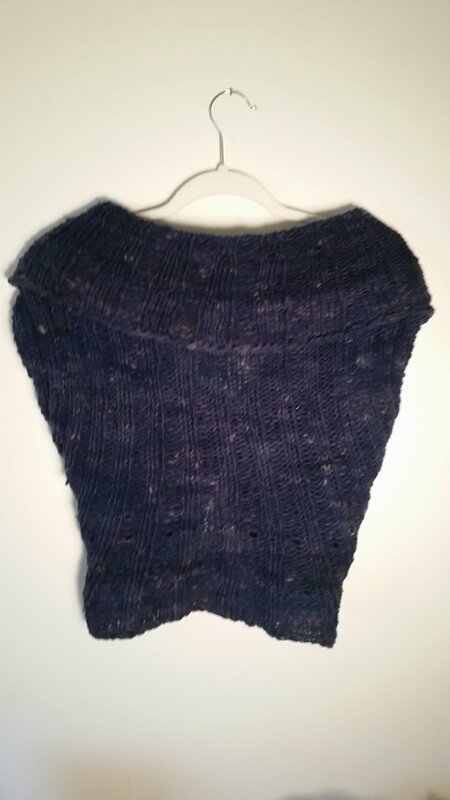 The pattern is the Shawl Collar Vest on Ralvery. It’s also a free pattern. I did make the shoulder portion longer than instructed, but my shoulders and arms are pretty stout for my frame. Lifting hay bales will do that. I didn’t have enough yarn to make it as big as I’d like, but honestly, I’m very pleased. I do plan to use this pattern again, and make a few as gifts. It’s quick, easy, and the sizing is flexible. If you’re looking for an easy and satisfying sweater pattern, this is it. Also completed this week is my new scarf. It’s just a simple lace border with plain garter stitch. It’s made from the very first fleece i ever processed. Interesting enough, this ram also ended up as the foundation ram for most of my flock. This scarf is part of a fleece study that will take several years to complete, and you will be hearing about my study periodically. But in the meantime, I’m enjoying my scarf! That’s it for this week’s Spinning and Knitting. Don’t forget to check out our brand new podcast on YouTube that airs today and feel free to leave your current projects in the comments below! See you next week. This past February I helped out on shearing day at my neighbor’s place. She graciously gave me a salvageable fleece with problems. The fleece has been in storage until recently. This particular ewe had a skin infection that caused skin flaking and small scabs throughout the fleece. However, it was mostly on the spine and rump. 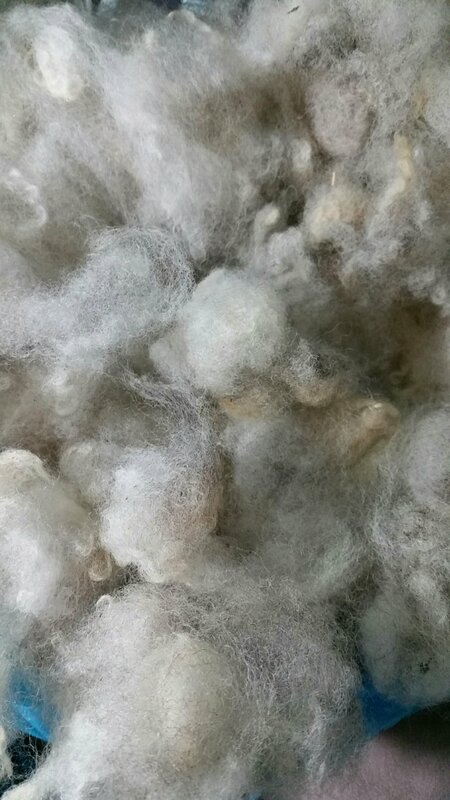 The rest of the fleece was nice and soft. I don’t know this ewe’s name, but she’s Oatmeal Girl to me because of her creamy oat color spots. The overall staple length is under three inches, and I suspect the micron count is in the low thirties to upper twenties. She’s also a freckled Jacob, so there are dark hairs in her light wool, and light wool in her dark spots. This is a love it or hate it trait, and fortunately a minority of Jacob sheep carry it. I personally fall on the love side. Since the staple legnth is on the shorter side, and there was some dander I decided to wash the fleece first. This time I used the washing machine, and just pine sol. 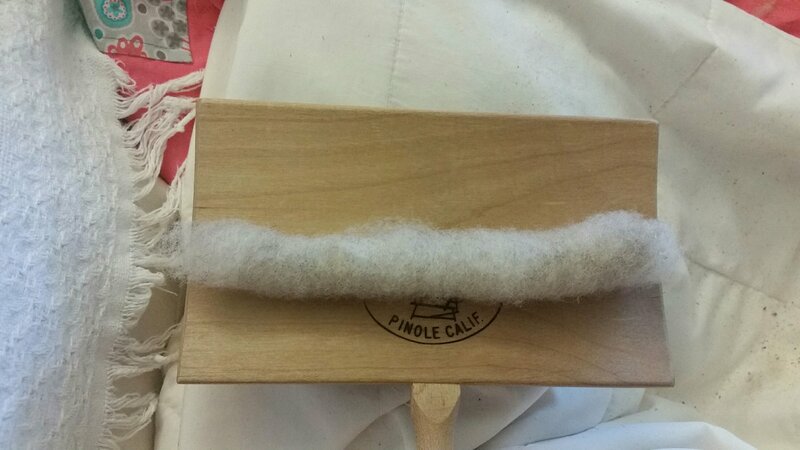 I wanted to kill off any fungus or bacteria that might be lingering before handling the wool. After washing, rinsing, and hanging out to dry, the fleece was picked on my Little Dynamo picker until fluffy. That’s when I discovered there was also a vegetable matter issue. However, carding on my hand carders really sorted out the matter. 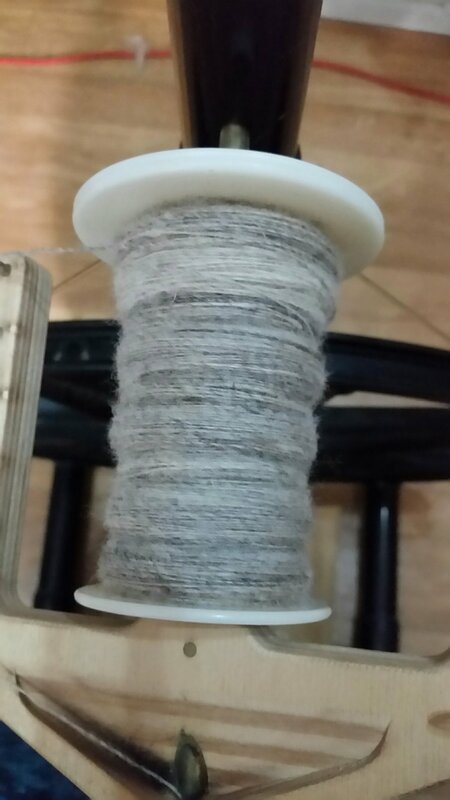 I still had to pick out some farm while spinning, but overall my rolags ended up clean. Once my carding party was over, Josephine, my Babe Production Wheel, and I set out spinning supported long draw singles. Since the bulk of this fleece is going to become warp thread for a new Jacob Sheep inspired blanket, Navajo plying (chain ply) seemed like the best choice. 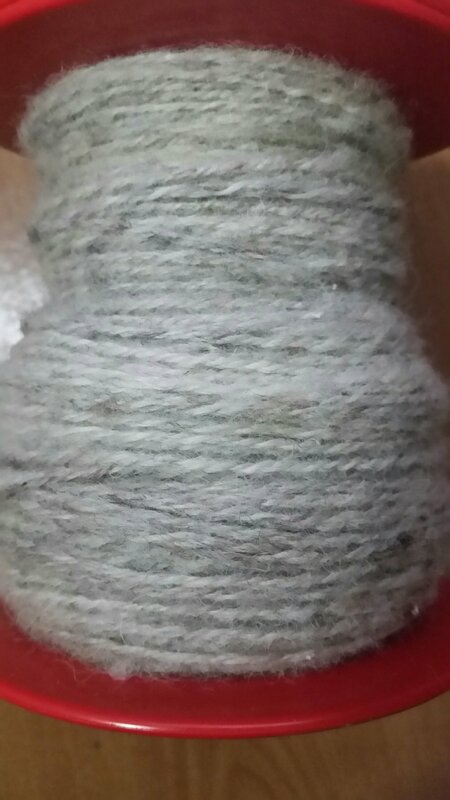 I ended up with a lovely three ply fingerling weight yarn that will hold up to weaving. I’m about half way through, and I’ll be spinning up the rest this week. 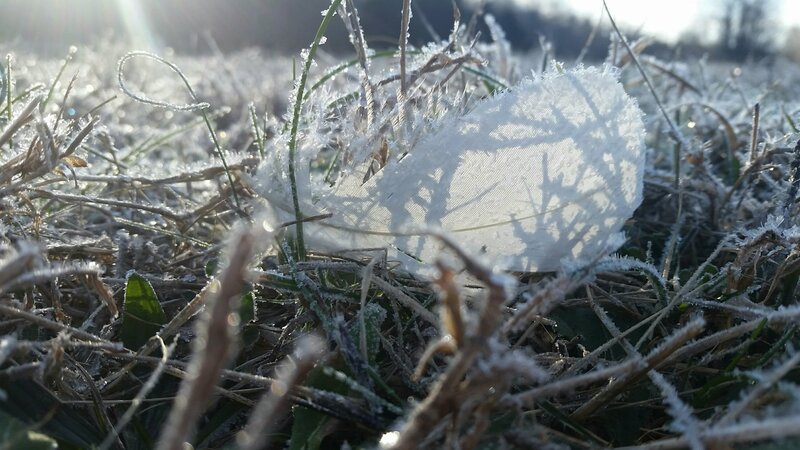 In our modern age of machine processed fiber it’s easy to overlook and simply toss fleeces that don’t meet milled standards. However, if I had gone with that idea I would have tossed nearly three pounds of nice usable wool. It was definitely more work, but the sense of accomplishment outweighs the extra five days in processing time. Besides, I dare anyone to beat the price! Because this fiber was softer than most Jacob I ended up having to put extra twist in, especially since I went with a Navajo ply. It didn’t come out as squishy as I hoped, but then again durability was the goal, not a fluffy scarf. Oatmeal Girl spent an entire year of her life growing this fleece, raising a lamb, and avoiding becoming dinner for coyotes or dogs. Why toss that? In days not too long past our mothers and grandmothers would have spun this fleece and been grateful for the opportunity to keep their families warm. What wasn’t usable for spinning will end up as mulch and eventually compost. Gratitude may be the biggest take away lesson from this fleece. Gratitude for good neighbors, a wonderful day, a free fleece, and a little ewe who gave an entire year of her work without complaint.